But the study said there is no “government-wide definition of what constitutes advertising” and no central place where agencies are required to report advertising-related expenditures. As a result, agencies can pretty much spend what they want. Apparently the agency's in-house PR department is not good enough, however. Since 2007, the EPA also has shelled out $15.1 million to outside public relations consulting firms. EPA spending to burnish its image is a fraction of what the government spends for the purpose. During five years ending in fiscal 2013, the government spent about $4.4 billion of our money on "advertising services." The biggest spenders in fiscal 2013 were the Defense Department ($419 million); HHS ($197.4 million); the Education Department ($128.8 million); the Department of Veterans Affairs ($61.8 million) and the Transportation Department ($43 million). I'm not sure what the purpose of this editorial was other than we were overdue for another attack on the EPA and this rewrite of a Fox news article sortof meets that goal. What about "patriotic" sports teams? At the same time Congress and the president have imposed caps on military spending, the Department of Defense has paid at least $6 million in taxpayer money to 16 NFL teams across the country, including$377,500 to the Jets, with the bulk spent by the National Guard. 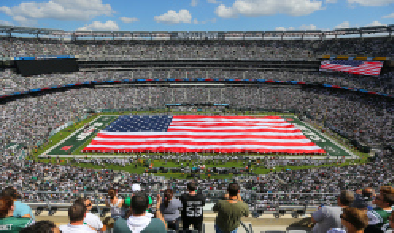 U.S. Sen. Jeff Flake (R-Ariz) last week called out the New Jersey Army National Guard for the spending, which, in part, paid for a segment at Jets home games in which soldiers were featured on the big screen, thanked for their service and given tickets to the game. Flake said most in the general public believe the segments were heartfelt salutes by their hometown football team, not an advertising campaign paid for with their money. The Guard defended the arrangement as an effective recruitment tool for the force, and the Jets pointed out numerous other ways in which they support the military. Those pro teams sure are patriotic -- especially when the government is paying for it. The article includes a list of pro football teams and the games that they were paid for. (The Steelers make the list for two exhibition games.) Senator Flake, in another Washington Post article, hints that a few pro baseball teams have also taken the government's money although I could not find which ones. Hmmm. If my memory is correct, I don't ever remember the Intelligencer criticizing this type of government PR.